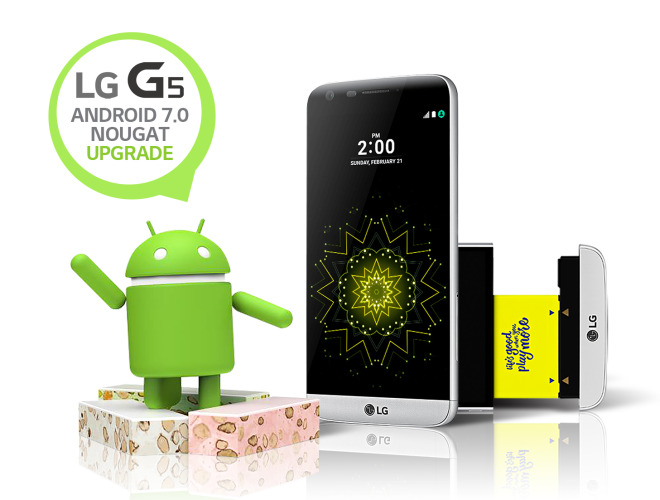 SEOUL, Nov. 8, 2016 — LG Electronics (LG) today began rolling out Android 7.0 Nougat OS for the LG G5 in LG’s home market of South Korea. LG, which was the first smartphone manufacturer to offer a Nougat experience out of the box with its LG V20 for content creators, has the distinction of being the first company after Google to offer Nougat as an upgrade to an existing smartphone running Android Marshmallow. While LG G5 owners in Korea are the first to receive the OS upgrade, they will be followed by customers in the Americas, Asia and other markets in the weeks to come. Most G5 users will receive notifications on their phones when the update is available. More information will become available locally in the weeks ahead. Android 7.0 Nougat offers a range of new features designed to enhance the user experience and deliver more speed and convenience to G5 owners. For example, searches can now be conducted inside user-installed apps as well as built-in apps using Nougat’s In Apps. New Multi-window allows the user to switch between apps with a double tap or run two apps side by side. More personalized settings and smarter notifications allow users to be more productive with less effort.